Takeo may not be on your bucket list when you visit Cambodia but once you're in Phnom Penh, Cambodia's capital city, take time to go and see this laid back city. In a day, you will see almost all of its interesting attractions but Takeo has more to offer. The Cambodian countryside as you drive to Takeo on National Highway 2 offers not only scenic views of pagodas, rice paddies and interesting tiny villages but also pre-Angkorian and Angkorian ruins that allow you to understand better and appreciate the power of the Khmer at certain times of history. The picture below is of Ta Phrom, a much smaller temple than the one you'll see in Siem Reap of the same name but if you only have a day to get our of Phnom Penh and not be able to go to Siem Reap, this temple is a good representation of the Angkorian temples. It is easy to take this day trip to Takeo now that the road system has really been improved. You can easily arrange transport as there are many private taxi drivers who will be happy to bring you to Takeo for $25. Of course, if adventure is what you seek, take the buses and experience the regular travel experience of ordinary Khmer. Most of the places are on the bus routes and once you arrive in the bus stops, there are always motodups (a ride at the back of the motorbike driver) or tuktuks (three wheelers) that will take you to the site. In Phnom Penh, you can take the bus from the Central Station just southwest from the Central Market. Make sure you ask about the station and schedule from Takeo back to Phnom Penh. You can also take a taxi or shared van from Takeo back to Phnom Penh. When you take the bus, you may want to stay a day or two in Takeo. There are good hotels there and their prices won't break the bank. Here's how close is Takeo to Phnom Penh. If you only have a few days in Cambodia, I suggest you get a car and a driver and do most of these Takeo attractions in a day. You can take the bus from the Phnom Penh Sorya bus station which departs every hour. 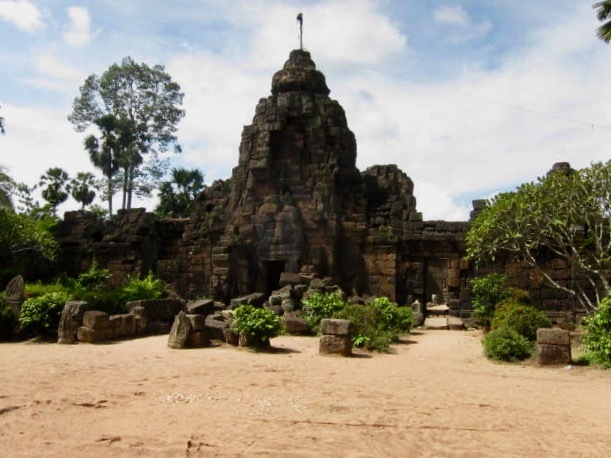 Get off when you reach the 35 km road marker in Tonle Bati and take the motodup to the base of two Angkorian temples, Ta Phrom and Yeay Peau, constructed in the late 12th century, the same period as Bayon and Angkor Thom in Siem Reap. ​Ta Phrom, the most impressive of the two, displays some well preserved carvings while Yeay Pov is a single sandstone tower beside an active pagoda. A scenic lake within walking distance from these two temples, Tonle Bati is a popular picnic place to get away from the scorching heat and noise of Phnom Penh. 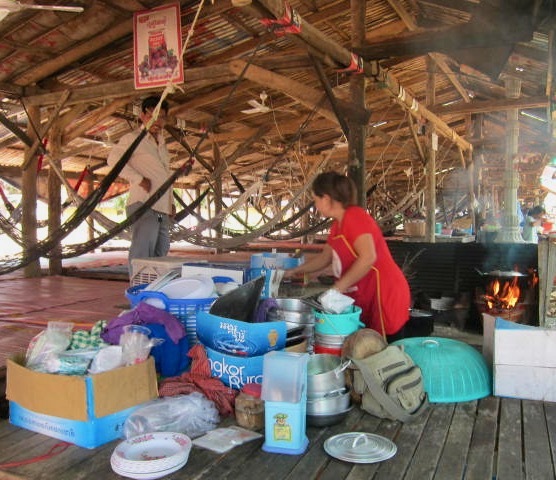 You can rent one of the bamboo huts, order some food or just buy from the vendors who paddle around the huts. ​It is very peaceful and you can swim if you want, cruise the lake in one of the boats for rent, paddle for a bit of exercise or just sleep and relax in one of the hammocks provided in the huts. Many from Phnom Penh go here to have a picnic and enjoy the zoo. It may not be the zoo you are used to in your own country but this one has lions, tigers, bears, birds and other animals. Close by is Prasat Tamao, sitting at the top of Phnom Tamao, a temple built in the 11th century by Suryavarman I. Take the bus to Takeo but this time, get off the 51 km road marker. 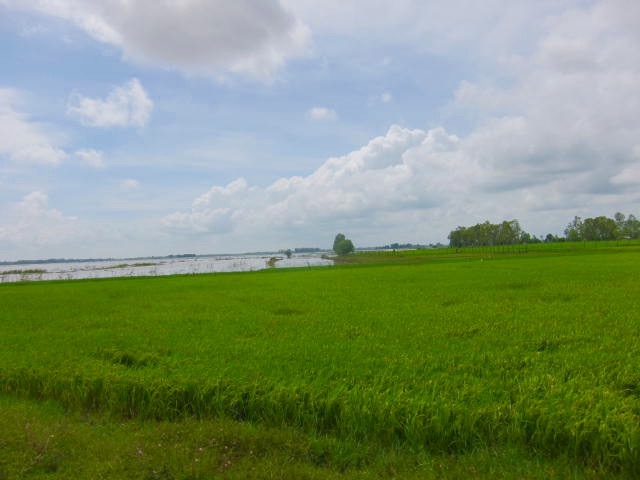 This is located in Rovieng commune, Samrong District. On a small hill right next to the road are two Angkorian brick prasats (towers), Prasat Neang Khmau, dedicated to Shiva and said to have been built in the 10th century. Take the bus for Takeo and get off at the 52km road marker. You won’t miss it as there is a big signboard, “Phnom Chisor”. Take a motodup to the site and start climbing the 503 steps to the top. You will be rewarded with a beautiful view of the surrounding countryside and Angkorian 10th to 11th century ruins which are well worth the climb. This temple is dedicated to Shiva and Vishnu as seen in the carvings that are still visible. You can take lunch here of roasted local chicken and stir fried vegetables. Walk around the eating area and find Por Phal, a vendor selling locally woven scarves. When we were there, our Cambodian friend talked to her and before I knew it, we were following her moto to her house nearby. She has more woven items in her house and we enjoyed our shopping. 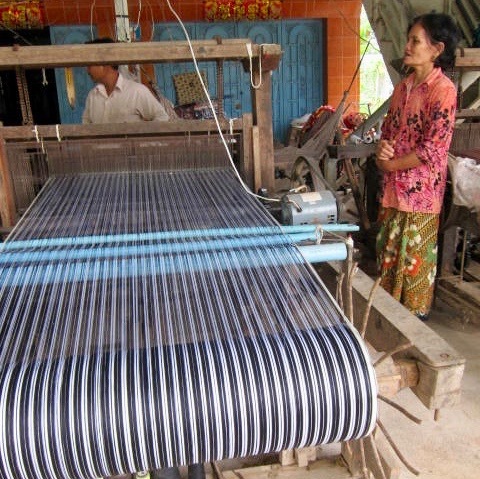 On the road to Phnom Chisor, you can visit houses of some of the local weavers. You can get contacts from the Artisans Association of Cambodia. around the year 1863 owned vast tracts of land and donated some of it for the use of the planners so the place was called Takeo. Ta is the address for an old person and Keo is a person's name. 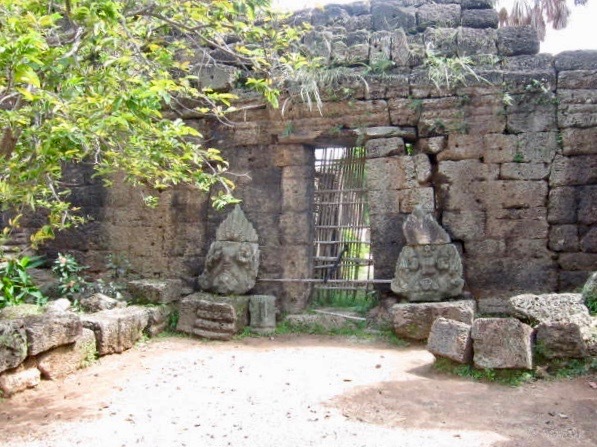 ​About 25 kilometers is the hill, Phnom Da, with its 11th century Angkorian temple dedicated to Shiva. Further down the hill is the pre-Angkorian Chenla temple ruin, Ashram Maha Rosei, constructed in the late 7th-early 8th century. From Doun Kaev, the capital of Takeo, you can take the boat to the ancient city of Angkor Borei, the seat of the ancient Funan Empire. 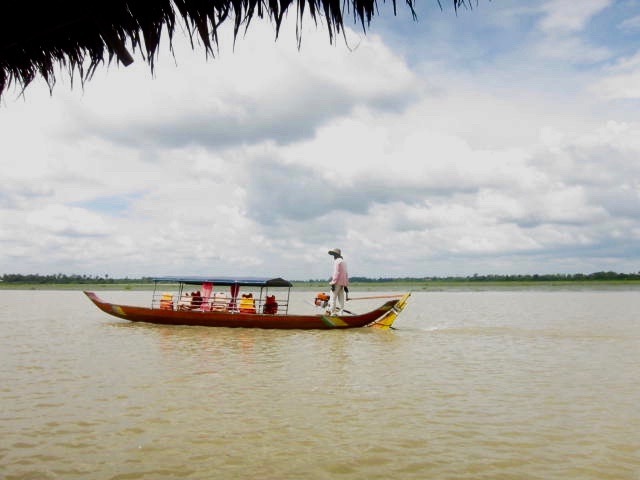 Watch the interesting video above of the boat trip to Angkor Borei. Angkor Borei is an area said to have been continuously inhabited for at least 2500 years as seen in some of the Neolithic artifacts taken from archaeological diggings in the area. These are displayed in a small museum there that also provides information on some of the diggings. 43 kilometres from Down Kaev, Takeo's capital, on top of a small mountain, are the ruins of a Temple built in the 2nd century. The middle tower holds a lingam representing the Hindu god, Shiva. It will take you about 20 minutes to the summit and around $7.50 for a round trip on a motorbike. A tiny water fall but when it is hot, you'll enjoy just being in the water. As this area is famous for gems, you can browse the shops around. The trip to Takeo especially by bus may be a bit uncomfortable but it certainly offers experiences that will be richer than just going around Phnom Penh. 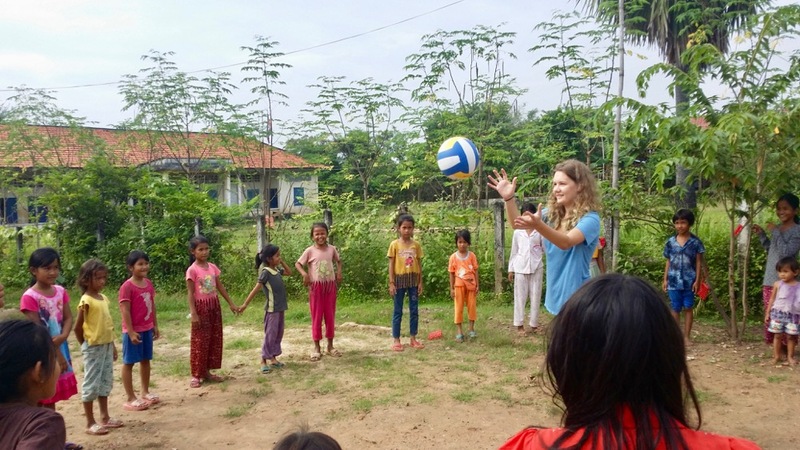 ​Being with the local people as they go about their local travel certainly adds more spice into your experience and will give you more stories to tell when you get home.